If you frequently travel as a couple, family or with a friend, it’s a great way to save a ton of money on flights. I’ve saved over $4,000 with the Companion Pass. And it’s not even that hard to get one. Earning the Southwest pass is straightforward. You simply need to earn 110,000 qualifying points in a calendar year. That might sound like a lot of points, but there are more ways to earn points than just by flying. The best way to earn a lot of Southwest Airlines Companion Pass qualifying points really quickly is to get a Southwest credit card from Chase. That’s because the sign-up bonuses offered by these Visa cards count toward the pass. While each of these Southwest Airlines credit cards offers anywhere from a 40,000- to a 60,000-point bonus (the offers change periodically), you can actually get several cards at once. That means that if you get the Southwest Rapid Rewards Premier Business card and either the Southwest Rapid Rewards Premier or Southwest Rapid Rewards Plus cards, you’ll have a total of 100,000 points toward the Companion Pass after earning the bonuses. You’ll have to spend $4,000 total to get those points ($3,000 on the business card and $1,000 on the personal card). That spending will earn you another 4,000 points, so you’ll have a total of 104,000 points toward the pass. You’ll have just 6,000 points left to go! This is how I got my first (of two) passes. It’s the quickest and easiest way, as long as you haven’t already taken advantage of these Southwest credit card offers. You may balk at applying for two of the Southwest Visa cards within a few months, but it’s worth it for all of the free airline tickets. Wanna fly from New York to San Francisco with a buddy? The pass will easily save you $300+. How about a weekend getaway to Fort Lauderdale from Boston? There’s another $200+. Everytime you fly with someone, you’ll keep raking in the savings. And remember, Chase business cards do not count toward Chase’s restrictive 5/24 rule. So you’ll only be taking the hit for one card. Of course, you’ll earn qualifying points when you fly with Southwest Airlines, but you can also earn qualifying points when you shop through Southwest’s Rapid Rewards shopping portal and join Southwest Rapid Rewards Dining, or when you make purchases with Southwest’s other partners. Rapid Rewards shopping is a good way to earn some quick points to top up your account. There are also periodic Southwest promotions with the carrier’s partners that give you extra points for car rentals, hotel stays and more. You could fly 100 Southwest one-way flights within a calendar year to qualify for the Companion Pass too, but for most people, qualifying with points will be much easier, faster and cheaper. The Companion Pass operates like status, not a flight reward, so you don’t have to trade in your points for the pass—you get both! This also means your points become twice as valuable because two people can fly for the same number of points as one person. Assuming Southwest points have a value of about 1.5 cents each, the 110,000 points you’ll need to earn the pass are worth about $1,650 in flights. Now if you double that, you’re getting a tremendous value of about $3,300 in flights! When you qualify, your Southwest Companion Pass will be good for the rest of the year in which you get it and the entire following year. For example, if you qualify in October 2018, your pass will be valid until the end of December 2019. 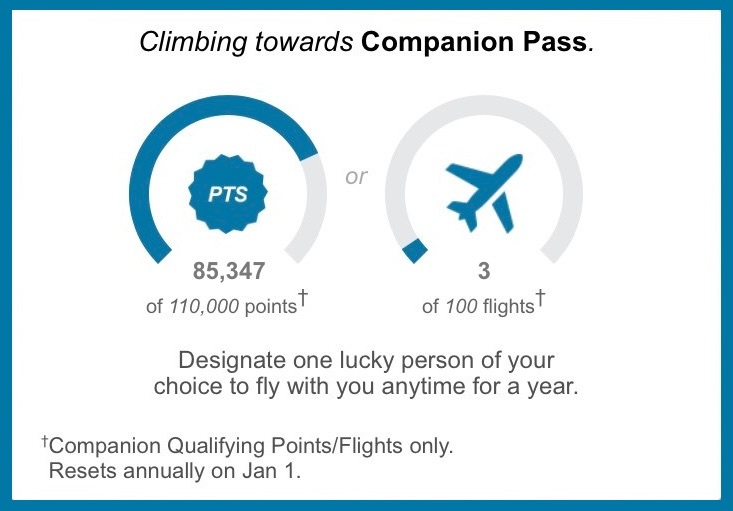 For this reason, it’s great if you can time qualifying for the Companion Pass early in the year as you’ll be able to get nearly two years of buy one, get one free flights. There once was a time, not too long ago, when you could earn tons of points toward the Companion Pass by getting Marriott Hotel + Air package deals. In fact, this is how I got my second pass. Through these joint Marriott and Southwest promotions, you can book a week stay at a Marriott hotel with Marriott points and get thousands Rapid Rewards points (there are other airlines, too). While these package deals are still a good way to use Marriott points, the Southwest Airlines rewards points you get with it no longer count toward the Companion Pass. The Southwest Companion Pass entitles you to nominate a companion who can travel with you on any flight that you book for only the cost of taxes (which start at just $5.60 per one-way domestic flight). In order to use your pass, you’ll first need to designate your companion. Just login to the Rapid Rewards program after qualifying for the Companion Pass. You will find a “Choose My Companion” button in the “My Account” section of your Southwest Airlines rewards account. After you’ve designated your companion, you can add them to any flight you’ve booked. When looking at your trips, you’ll see an “Add Companion” button where you’ll be able to confirm your companion’s information and then pay the taxes for your companion’s free ticket. While you can only have one companion designated at a time, you are allowed to change your companion three times per calendar year. That means you don’t have to pay extra if you want to take someone different with you on a couple of flights. Very convenient. All you have to do is login to your Rapid Rewards account and follow the steps above to add a new companion. Note that if you have flights booked with a companion and then you switch to a new companion, all of the flights will be cancelled. You’ll want to keep this in mind if you want to swap out your travel buddy. You, the Companion Pass holder, must be on all flights with the designated companion. You can’t get around that. What’s the Southwest Companion Pass Worth? Putting a value on the Southwest Companion Pass is difficult because it depends on how much you use it! I’ve had the pass twice and have definitely gotten some good value out of it. The current Companion Pass that I have has been used for 11 one-way flights, and I plan to use it at least four more times this year. Assuming that each flight has an approximate value of $150, having the pass has saved me well over $2,000 so far. I don’t know exactly how many times I used the Companion Pass the first time I had it, but I estimate that it was at least this much. As I mentioned above, having the pass can effectively double the value of the 110,000 points it takes to earn it. So that’s at least $1,650 in flights (assuming you use the pass for all of your award flights). If you fly with a companion more often than I do, or only take more expensive flights (like Southwest’s flights to the Caribbean), you could easily save twice as much as I have. If you only travel once or twice a year, though, the Southwest Companion Pass might not be that valuable to you. You can use the pass to take a friend with you for free to any of Southwest’s 100 destinations. While I usually think of Southwest as a great option for cheap domestic travel—they serve 40 states—they also fly to some excellent vacation spots. If you’re looking for a quick (and cheap) weekend getaway for you and a friend or family member, consider taking Southwest to Puerto Rico, Mexico, Central America or the Caribbean. They even fly to the Turks and Caicos Islands! It’s clear that the Southwest Companion Pass can be incredibly valuable, depending on your travel habits. While it might sound like earning the 110,000 qualifying points is really difficult, with so many ways to earn points it’s actually not as hard as it seems. And if you don’t already have the Chase Southwest credit cards, the big sign-up bonuses make it very easy. In the end, though, only you can decide if you’ll use the Southwest Companion Pass enough to make it worth it to you.